Today, January 23, will be a full rest day at Plaza de Mulas for our team. We have already spent 3 nights at this elevation, 14,400ft/4,390m feet above sea level. The slow pace is paying off, each of the team members, Howard, Winston, Paul, Lisa, Paule and Linda are improving in their acclimatization. 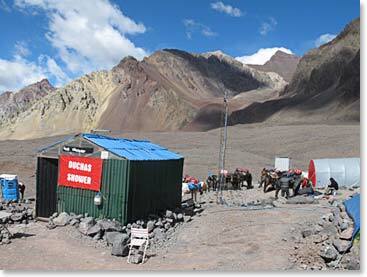 We are here to climb a very big mountain – the highest in the world outside the Himalaya and other great ranges of Asia. If we are to go all the way to the summit at 22,841ft/6962m, we are going to need a solid base of acclimatization and conditioning to have any chance of success. The team members are eager to get showers today. Life here at Plaza de Mulas is not bad. We take our meals in a restaurant run by Juan and Rocia. The meals are great and they make a welcoming home for us. 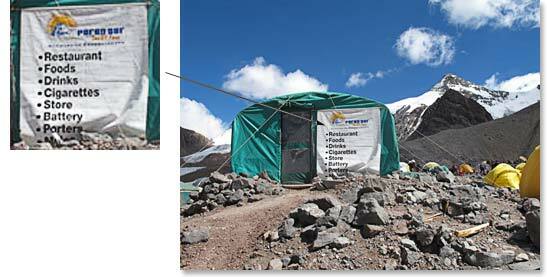 Today with a full rest day, the team is off to take showers at a nearby business which caters to Aconcagua climbers who have gone for days climbing and living in the same clothes, just as we have. Today’s full rest is well deserved after our team’s successful first carry of equipment to one of our high camps, Plaza Canada, at an elevation of nearly 16,600ft/5,050m. We did this carry on Sunday. Everyone performed at a very high level on this challenging carry. The Canadian climber’s packs were all between 15 and 30 kilos. The Bolivian BAI staff climber’s packs were much heavier, of course. Osvaldo, Sergio and Maria are carrying all our group camping and climbing equipment as well as the food and fuel for our entire team. They are also carrying the climbing gear, sleeping bags and other items belonging to the team members who elected to pay for extra porter support. This was the Bolivian team’s second trip to Plaza Canada and in the afternoon on Sunday while we were all resting after our carry to Plaza Canada the Bolivian team continued on the Camp II, Nido de Condor, to leave more supplies there. We had all returned to Plaza de Mulas on Sunday afternoon. 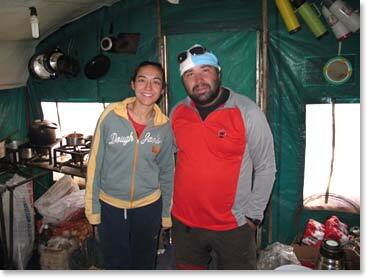 Osvaldo and his team were back down from Camp II by 8:00 pm. Rocia had prepared very large roasted chicken breasts and potato casserole for our dinner. A few members of our team were tired from Sunday’s exercise that their appetites were not strong. Everyone ate something however and we were all off to bed with our hot water bottles prepared by Juan to warm our sleeping bags by 9:00 PM. We take our meals at Plaza de Mulas in this restaurant. Our tents are just behind, so it is easy to go for breakfast and dinner. Rocia and Juan are preparing fabulous meals for us.